Happy October! 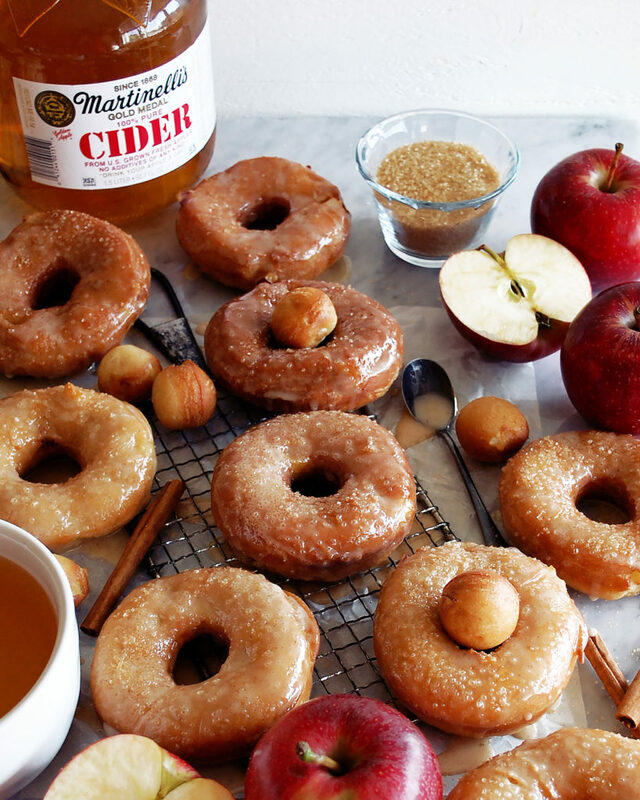 I couldn’t think of a better way to kick this month off than with some delicious cinnamon apple doughnuts. I’ve been talking about fall things for a while now, but the temperature has finally dropped around here, so it’s actually starting to feel like a reality. I went to the farmer’s market this past weekend, too, and the sight of all the beautiful squash, pumpkins, and apples really made me feel like this season is in full swing! 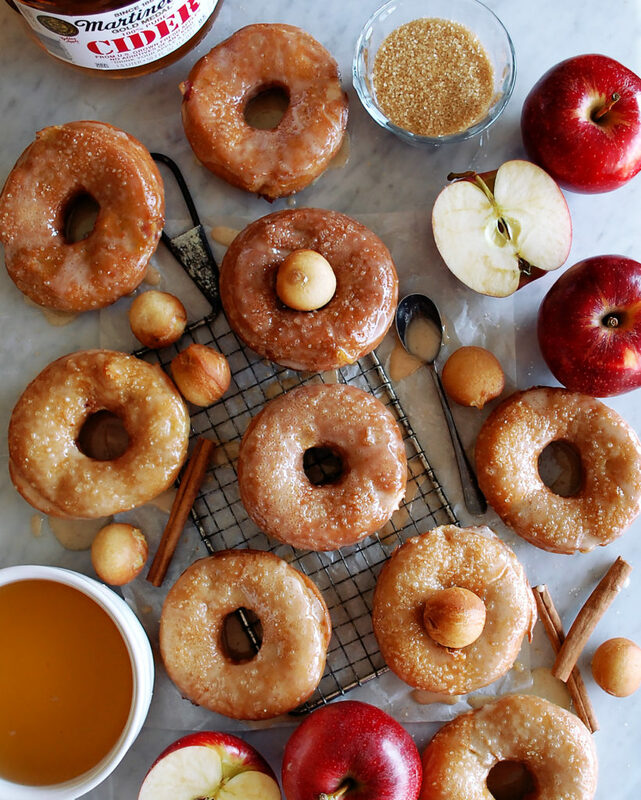 The apples have been especially delicious, so I definitely wanted to share these cinnamon apple doughnuts today. 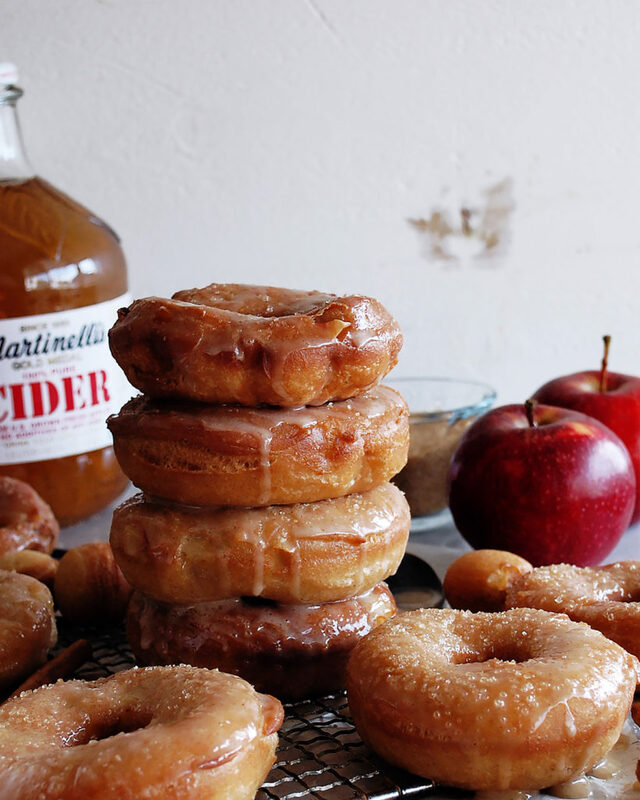 Besides, fresh homemade doughnuts just feel like the perfect October project. I kind of envision making these on a really crisp fall morning when you want to slow down and do something special. 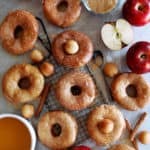 I’d have a pot of apple cider simmering on the stove, too, to sip on while you make these, and to perfume the kitchen with that wonderful cozy smell. There’d also probably be some candles lit and some of my favorite autumn music playing in the background. …I’m definitely going to have to make these again with that exact setting, because I actually made these pretty rushed on a busy Saturday afternoon. 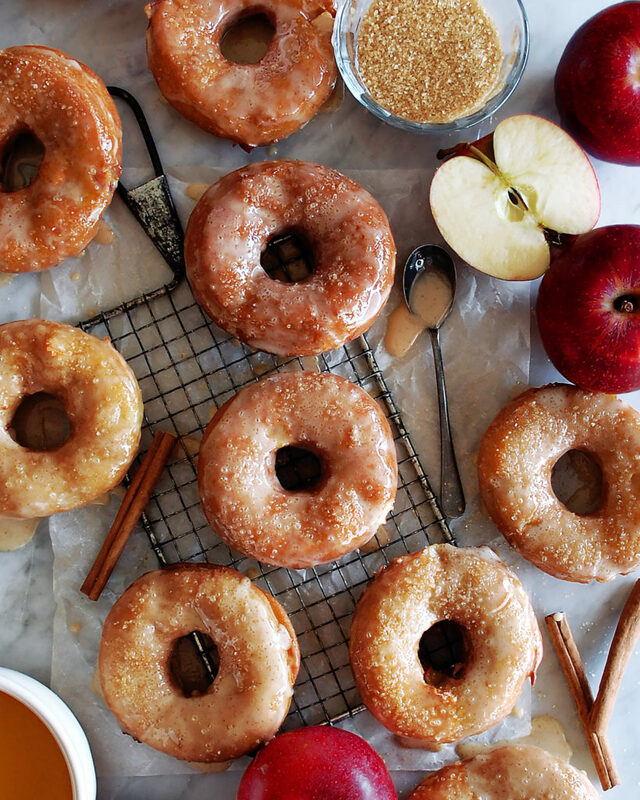 AND finally, the dough is fried in hot oil, resulting in mouthwatering, fluffy cinnamon apple doughnuts! I hope you love these doughnuts as much as I do. Whether you have some free time this week or want to wait until you can relax and cook over the weekend, this recipe will bring all the cozy fall feelings into your kitchen. Enjoy! Combine the water, apple cider, and yeast in the bottom of a stand mixer bowl. Stir to dissolve and let sit for 5 minutes. Add the beaten egg and sugar. Whisk to combine. Add the milk powder, bread flour, pastry flour, baking powder, salt, and cinnamon to the bowl. Attach the bowl to the stand mixer. Using the dough hook attachment, mix on speed #1 until the ingredients are incorporated. Add the softened butter. Mix on speed #2 for 8 minutes. Fold the apples into the dough. Remove the dough from the bowl and place into a separate, floured mixing bowl. Cover with a towel and let bulk proof for 30 minutes at room temperature. Roll out the dough to ½” thickness on a floured surface. Use a circular cutter to cut the dough into circles. Use a smaller circular cutter to cut out the middle of each. Take the remaining dough trim and roll it into a ball. Repeat the process until all of the dough is used. Cover the cut-out dough with a towel and let proof for 15-20 minutes on the counter. Fry the doughnuts at 350F in a pot of oil or a deep fryer. They should fry for about 3 minutes on each side, or until golden and cooked through. Carefully remove the doughnuts from the oil and let drain on paper towels. Add the apple cider and cinnamon stick to a small saucepan. Bring the liquid to a simmer. Let reduce until the cider is syrupy (you want to be left with 6 tablespoons of reduced cider). Let cool. 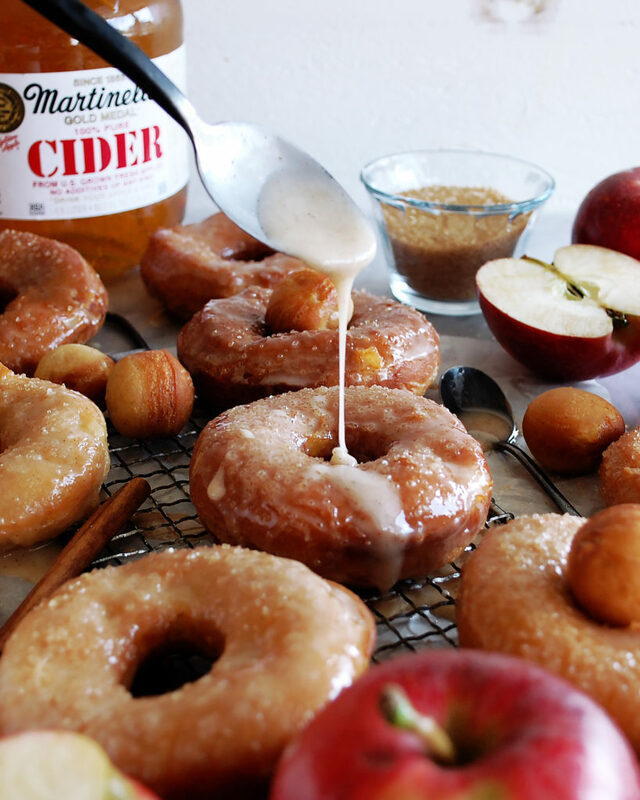 Combine the cooled reduced cider, powdered sugar, salt, and cinnamon in a mixing bowl. Whisk until smooth. 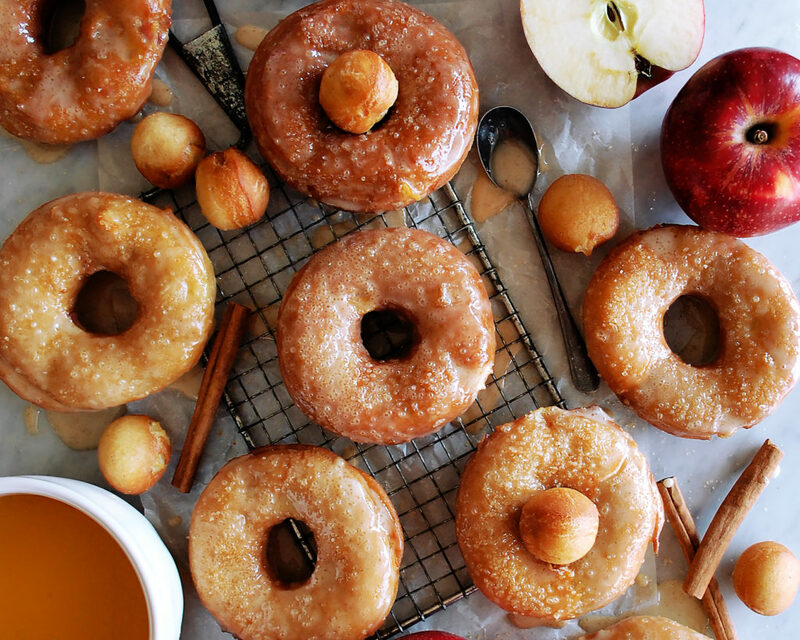 Glaze the cooled (or partially warm) doughnuts by dipping them, top-side down, into the glaze. Turn them out onto a sheet rack to dry. Dry for 3 minutes. Dip them into the glaze again. Sprinkle each doughnut with a little raw sugar. Let dry for another 5 minutes or so before serving. Yes, such a good one! !